Great crested newts are not popular with builders. But will they thrive in their new surroundings? But science is about testing assumptions. That was my job as Professor Downie's postgraduate student. That's because simple population counts aren't very accurate - and they don't take account of survival rates. To study individual newts scientists need to be able to tell them apart. He's held safely and securely, sandwiched between the perspex, so you can take photographs of him." 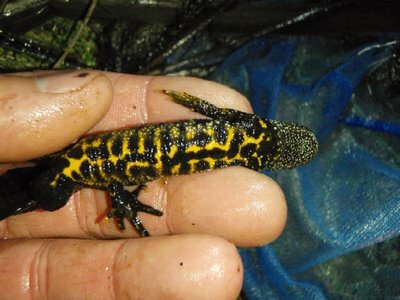 So as the end of the project approaches how are the translocated newts doing in their new home? To get all the answers you need to come back and talk to us again in six months - when I'll have done all the work, written it up and got my PhD. Great crested newts are not popular with builders. Why not? Well, this little amphibian is struggling to survive as a species in Britain and is protected by law. So if a builder buys a piece of land, then finds great crested newts on it, he can't just fill in their ponds and build houses. He has to make sure the newts are safe first. They won't be if he just goes ahead, digs his foundations and starts building. So the newts have to be moved. Where? Well anywhere they can go about their business of eating, sleeping and making more newts. It's called translocation. But suppose you were living somewhere quite happily, then one day got snatched up in nets, put into buckets and taken somewhere else. You might do well. You might not. It's the same with newts. It's certainly better to move them than bury them beneath 60 tonnes of bricks. But will they thrive in their new surroundings? That's the question Debbie McNeill at Glasgow University has been trying to answer at a building-site in Gartcosh, where the first major translocation of great crested newts in Scotland took place. "The basic question is how is the population doing," she says. No one has tried to answer this question before for a large translocation of great crested newts. Newt-moving is done by experts in the impact of human activities on wildlife - known as ecological consultants. 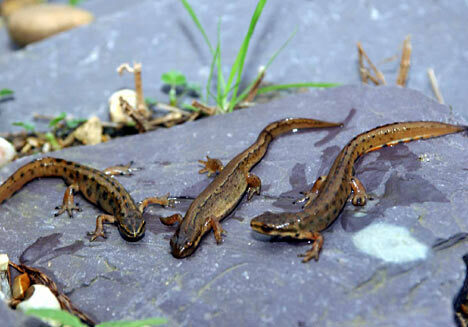 A Perthshire company called Heritage Environmental Ltd carried out the work with the Gartcosh newts. These companies use established techniques to capture the newts, their young and their eggs. 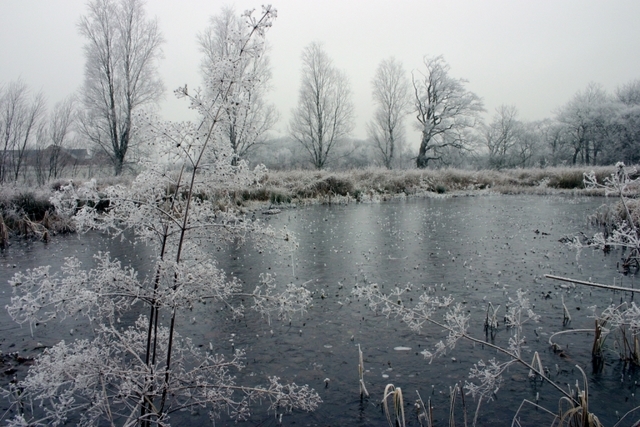 "They created 24 new ponds for them and over a period of three years captured all the amphibians they could and moved them into these," Debbie explains. But the consultants aren't paid to go back year after year and check how the newts are doing in their new homes. The assumption is that if the job is done right the animals will be fine. But science is about testing assumptions. It's about doing experiments and finding out what actually happens - which often isn't what you assumed would happen. So Scottish Natural Heritage provided funding to Glasgow University's Roger Downie to study the newts after they'd been moved, and find out how they were doing. "That was my job as Professor Downie's postgraduate student," Debbie says. "I've been doing it as a part-time PhD. It's called 'Translocation of a population of great crested newts: A Scottish case study'. "Because it was part-time it took five years. So we were able to study the newts every year for four whole seasons. 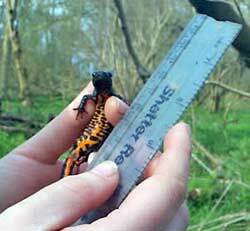 That let us build up a really good picture of what happens to translocated newts." Some of Debbie's techniques were similar to those used by Heritage Environmental. But she also developed scientific methods to look in detail at individual newts. "That's because simple population counts aren't very accurate - and they don't take account of survival rates. "So a steady population of 100 newts, say, might make you think everything was fine. But the steady numbers could be masking real problems. New recruits could be coming through, for instance, but your original newts are dying off for some reason." To study individual newts scientists need to be able to tell them apart. This is possible with great crested newts - even if you're not another newt - because each one of them has a "unique belly pattern, a series of black spots and splotches", Debbie explains. So with a bit of effort a scientist can tell if the newt she captures today is the same one she captured a year ago. "Originally I devised my own method, using a Ferrero-Rocher lid, for holding the newts still to photograph their belly patterns," Debbie says. "That worked reasonably well. But then I found a piece of kit designed for the task called a Mander masher. Essentially this is two pieces of perspex with raised hinges and a sponge attached. "You let the crested newt walk across the perspex, close the sponge on top of it, then flip it over." She holds her hands up, fingers splayed, to show what this looks like. "He's held safely and securely, sandwiched between the perspex, so you can take photographs of him." All nice and easy so far, but the next step is harder. "I check through all the photographs we already have to see if we've seen this newt before. During the translocation they photographed 1012 newts and I've taken many hundreds of photographs since. So that's a big job." Pattern-matching software might have been used, she says. But that would have been costly and time-consuming to set up. "Weighing it all up, it seemed easier to do it by hand." As the project draws to a close the nature of the science changes, Debbie says. "You're building a picture up over years. So you have to wait to the end before you can study the data you've gathered. That's the stage I'm at now. The fieldwork is done - the lovely outdoor part, the pulling on wellies and wading about. The next six months are about analysing the data and writing it all up." The expression on her face says clearly that this is not her favourite part of the project. But there have been harder parts, she says. "Newts are nocturnal. So you have to wait until after dark to catch them. In summer in Scotland that can mean starting at 11 at night and going on sometimes till 3 in the morning. Then I had to get up for my work. That made it tough sometimes." So as the end of the project approaches how are the translocated newts doing in their new home? "At this stage we can say that Heritage Environmental did a good job of the translocation," Debbie says. "On the whole the newts seem to be doing well. There's a suggestion though of some problems with one of the zones, but we'll need to do all the analysis to see if it's real or an artifact of the data. "To get all the answers you need to come back and talk to us again in six months. When I'll have done all the work, written it up and got my PhD.